Alright, this week ended up much, much better on the training front. For the first time this since training began, I managed to get in all four runs, plus some cross-training. It was a step-back week (as every third or fourth week should be, regardless of whether you are training or not), which gives the body some rest. My long run dropped back to six miles, so I took that opportunity to add back in the fourth day of running without adding too many miles too soon. That’s a recipe for injury. Tuesday’s run was at my 10k pace, while Wednesday’s run was at half marathon pace. While I’m focusing on the NYC Marathon, I’m also training for a half marathon four weeks after. I’ve had a long-standing goal to break 2:00 in the half, coming up just short at the Germantown Half Marathon back in March. I’d really like to cross that one off the list, so I’m hoping this extra pacing and practice will pay off. Thursday is my hills/intervals day, because Friday is a rest day from running. Living in Memphis, actual hills are few and far between. The longest I’ve managed to find is about 2/10 of a mile, so I did that five times at a bit over 5k pace, totaling four miles with warm-up and cool-down. I need to remember to switch off auto-lap and auto-pause when doing these, my splits were all jacked up because of that. Saturday’s long run was a quick jaunt to Mud Island and back. Going to the Island is good because the AW Willis bridge is basically straight up and straight down, which helps to add some variety to the otherwise flat Mississippi River pathways. This morning I managed to wake up early and go for a bike ride. I normally drive out to Shelby Farms and ride those paths, but with the park under some serious construction, I decided to finally brave the city streets. I went out early, when I knew most of Memphis would still be asleep. I weaved my way around the downtown streets, over to Tom Lee Park and finally got to ride on the new bike lanes. The first thing that hit me: Memphis has some serious road quality issues. They really need to spend some money fixing them up, they are horrible! Going over the AW Willis bridge was interesting, my heart rate was skyrocketing by the time I got to the top. Once there, the road was much better. 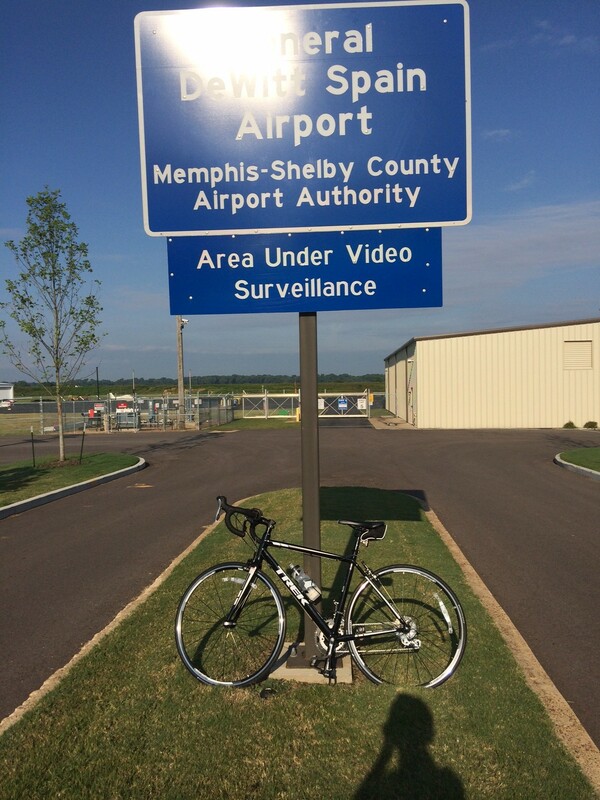 I rode to the end of the Island and kept on going, finally stopping at the DeWitt Airport and turning around. All in all, it was just under 13 miles at an extremely leisurely pace. All in all, a fairly solid week of training. Next week will be another step up, as my long run gets to 11 miles. Thanks Tillybruce! I appreciate it! What marathon are you training for?